Approach each one of the sisters with the same love with which you approach Me; and whatever you do for them, you do it for Me. Do You Need to be Set Free from Stuff? Boxed In: Do You Need to be Set Free from Stuff? by Bryan Cones is a Lenten article, but it is relevant every day of the year. He tells of needing to store half of his belongings in a storage center while his house was being renovated. "I lived for a year without half my things, and I never really needed them. . . Why was I keeping all this stuff? . . . As I looked at my books and papers - almost all of them from my seminary and theology school days - I was surprised by my own unacknowledged sadness. Most of that library was a collection of dreams unfulfilled . . . There was regret, disappointment, even a sense of failure that I hadn't lived up to expectations. And as long as they were there in front of me, living where I live, I wasn't going to move on." What things are you holding onto that keep you from moving forward? I was introduced to this painting, "Kitchen Maid with the Supper at Emmaus" by Diego Velazquez in the May 2011 issue of U.S. Catholic. I never thought of there being a servant at the Supper at Emmaus but it is quite likely that there was. This is a representation of an unknown woman, who like St. Martha before her, busied herself in the kitchen and served our Lord. She seems to have one ear listening to the miracle going on in the next room. She appears to want to long to take part, but her place is elsewhere. I would like to think if there was such a woman, the Lord would have reached out to her as well. Nevertheless, this painting reminds us of the invisible ones who serve. Who has served you lately that you have failed to acknowledge or even notice? "Why I Became a Sister"
I always enjoy reading vocation stories. I like to hear how God calls people, even today, amidst all the noise of the world. We are all called in some way. We just need to pray and pay attention and be willing to say "yes" when the moment comes. 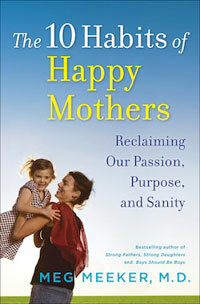 Meg Meeker, M.D., author of "Strong Fathers, Strong Daughters" and "Boys Should be Boys" has now turned her attention to motherhood with The 10 Habits of Happy Mothers: Reclaiming Our Passion, Purpose, and Sanity . I haven't had the pleasure of reading this one, but it looks intriguing. Friendship. Simplicity. Love. Value. Faith. Solitude. Money. Fear. Hope. Purpose. Dr. Meg Meeker has seen mothers struggle with these ten issues for the past twenty-five years, and it has become her passion to help them live less stressful, happier and more fulfilling lives. Her goal in writing The Ten Habits of Happy Mothers is to show women how to reduce loneliness, anxiety, depression, and low self-esteem by inspiring them to embrace more positive emotions and habits. Using inspirational stories and specific action plans, Dr. Meg shows mothers how they can live more simply, learn to make time for solitude, understand their value as mothers, embrace healthy friendships, confront their fears, seek hope, find their spiritual center, reconcile their relationships with money, and learn to live boldly and deliberately. I had the privilege of being a sponsor for an RCIA candidate at the Easter Vigil this year. My parish welcomed several individuals into the faith. Three received the sacrament of Baptism; others received First Communion and/or Confirmation. These adults provide such a powerful witness. They were excited and nervous prior to the ceremony and totally committed to what they were about to do. I am a cradle Catholic. While I have learned intellectually about other faiths, I have never known anything else. I have certainly had times when I have struggled with sin in my life and my relationship with God has not been what it should be, but I have never been away from the faith. I never stopped going to Mass; I never stopped praying. My faith has been my strength in my darkest moments. I can’t imagine life without it; I wouldn’t want to. I consider this a blessing. Yet, there is something to be said for the incredible decision these individuals have made. They chose the faith. They have studied for a year, considered the ramifications, and decided that the Catholic Church is something that they want to be a part of. The choice was not made for them, as it was for those of us brought up in the Catholic Church. The choice is theirs. They own it. I do not know the stories that brought them to this day. I do not know how or when they first received the call to explore the Catholic faith; the struggles that they faced along the way; the opposition that they may have come up against. I do know that such a major life choice does not come easily. I also know that the path they have chosen is not an easy one. They have chosen “the road less traveled” and it will indeed “make all the difference” for them. The world at large says that faith doesn’t matter; following the commandments doesn’t matter; going to Church doesn’t matter. Life is about doing what feels good at a given moment. Eternal life is rarely given more than a passing glance. These converts have decided that the world is wrong. They have chosen to make a public statement that they want to be different, to live differently. Those of us who have always been Catholic can learn from these newest members of the Catholic faith. We can embrace their enthusiasm. These are people in love with the Catholic faith. They were so excited to receive the sacraments. While Baptism and Confirmation are one-time events, how often are we excited to receive Communion or go to the Sacrament of Reconciliation? Do we appreciate the miracles that we are so blessed to receive? We can also make the choice to live fully Catholic lives. Even those of us raised in the faith need to make the adult decision to continue following it. It isn’t a one-time decision. These converts may feel that this is the end of one part of their journey – the culmination of study and discernment. Indeed, it is. It is a moment to be celebrated. But it is also a beginning. They have made the choice. They now must live their lives as Catholics. They have been called to a new way of living. Each one of us is called as well. Every day we must make the choice to be committed to our faith and to make decisions in keeping with that faith. Please join me in welcoming and praying for all the new members of our Catholic faith. We are blessed to have them as part of our Church family! 4. 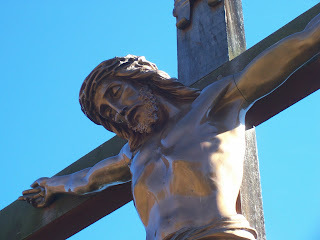 My God, My God, why have you forsaken me, (Matthew 27:46 and Mark 15:34). I've been privileged to write for CatholicMom since 2004. She gave me a chance when I was a writing newbie. Lisa Hendey is a remarkable woman and I am so very happy for her! and the forthcoming A Book of Saints for Catholic Moms, was selected from over 750 entries and invited to the Vatican for an international gathering of 150 Catholic bloggers to be held on May 2, 2011—the day after Pope John Paul II will be beatified in St. Peter’s Square. Upon hearing that she was selected to attend the Vatican blogger meeting, Hendey said, “I am so humbled and honored to be among the 150 bloggers selected. It was an absolute surprise. . . . I'm thrilled to have this tremendous opportunity.” Hendey intends to provide regular updates via her Twitter and Facebook profiles during the Vatican meeting and invites anyone interested to follow her on these platforms. Hendey, who founded CatholicMom.com in 2000, began as a stay-at-home mom teaching herself web design and blogging platforms, and eventually started the renowned Catholic Moments podcast. Her site welcomed over 500,000 unique visitors to its thriving online community in 2010; these numbers represents visits from people in nearly 200 countries. Based in Fresno, California, Hendey routinely leads workshops and lectures around the country, encouraging Catholic moms in their vocations and teaching priests, diocesan and parish staff, and lay ministers how to integrate new media technologies into their ministries. This was forwarded to me today. Sounds like a great idea. praying of the Rosary by all Christians! pray your Rosary between Noon and 3:00pm. and on the whole world'. I read this article when it first came out in 2008 in U.S. Catholic : Baby's First Holy Week - I think it is one that most mothers of young children can relate to. I know that I didn't get to go to Holy Week services for five years after my children were born (except for Easter Sunday). Autism is well-known. Like most parents, I knew to look for the signs when my children were young. Did they respond to other people? Did they have appropriate verbal skills? Were they affectionate? My answer was “yes” on all counts. I therefore never considered autism as a possible diagnosis for my “different” child. I read every parenting book I could get my hands on trying to understand and help him. I came up empty. His diagnosis came as a surprise, but it has been wonderful to be able to learn and understand why he is the way he is. I love my son. Asperger’s is not a definition of who he is – simply part of the package. It is important to note that Asperger’s is not a disease to be cured. It is a brain difference. People with Asperger’s are simply wired differently. Various therapies and educational modifications can help them learn to function as “normally” as possible in the world at large and to manage their stress. I am not an expert in Asperger’s Syndrome. Only a mental health professional can make a diagnosis. Over the course of the past year, however, I have done a great deal of reading on the subject. I write from my personal experience in the hopes of educating other parents to the signs of Asperger’s Syndrome, both so they might recognize the signs in their own children and be understanding of other parents whose children may be on the spectrum. Difficulty in social situations – they have a hard time “reading” other people. They may seek other people out, but they tend to stay focused on what they want to talk about as opposed to the reciprocal give and take of a normal conversation. Many have difficulty with eye contact. Some have a robot-like tone to their speech. Repetitive routines – enjoyment of doing the same things over and over. Odd body movements – clumsiness and/or repetitive body movements, especially when experiencing stress. Resistance to new situations – new situations can be terrifying. They prefer the familiar. They frequently experience high anxiety. Rigid thinking – there is one way to do things. Any deviance from that causes stress. Catastrophic thinking – there is no bright-side. The worse-case scenario is this first (and often the only) one thought of. Emotional melt-downs – stress causes complete emotional melt-downs which may feature crying, screaming, and lashing out. Sensory sensitivity – picky eaters, dislike of certain clothing, noises, etc. Extreme sensitivity to physical discomfort. Fixated interests – often have one area of interest that they will engage in/talk about for long periods of times. If you recognize several of the above symptoms in your own child, I would encourage you to speak with your pediatrician or seek a mental health evaluation. I have gotten a little better with age. I’m still reluctant to ask for help, but if it is offered, I do try to accept gracefully. I have come to understand that other people need to serve as well, and sometimes it is OK if I am the beneficiary of that service. Indeed, I am thankful for it. We all need each other in this world. As important as it is to serve, it is also important to allow oneself to be served. Sometimes, that can be the harder lesson to learn. What are Your Choices Adding up to? "When you think about a saint you're not really thinking about a sort of continuum. You're thinking about lots of acts - lots of times when different things could have been chosen, but certain things were. So, I felt with Josemaria's life, what I was looking at was a series of choices. And if you imagine those like beads on a necklace, you could say that after many choices have been made, this man was a saint. But eit was each individual act that counts." What are the stones you use? We have all heard and perhaps said that old ditty - "Sticks and stones may break my bones but names will never hurt me." And we all know it isn't true. Words have tremendous power to cut to the soul. The pain can last much longer than a physical injury. What are the words you use? Do they build people up or tear them down? What are the names you call yourself? Do you harm yourself with your own "stones?" Descriptions such as "weird, worthless, loser, dimwit, bum" and other unseemly labels are hurtful stones. Each negative remark becomes a harmful projectile thrown at the Body of Christ. In this season of Lent when we renew our efforts to be Christ-like, let us be intentional about putting down our stones. "Why God Matters" wins Book of the Year Award! 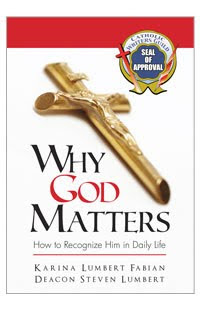 I'm pleased to announce that Why God Matters: How to Recognize Him in Daily Life by Karina Fabian and her father Deacon Steve Lumbert won the Christian Small Publisher Association Book of the Year under the Christian Living category. I had the privilege of reviewing this book a while back. I'm reprinting the review here for your convenience and to help spread the word about this wonderful publication. Congratulations Karina and Steve! While I was perusing their site, I also saw that they offer books dealing with NFP when it is difficult to chart (i.e. during breastfeeding and premenopause). Visit their Manuals page for more information. I saw Holiness Is Always in Season advertised in the Ignatius Spring Catalog. Anything by Pope Benedict XVI is well-worth reading and this looks like a great book. For a Christian, the way to reach perfection is to strive for holiness. What is true perfection? Christ's words are clear, sublime and disconcerting: "Be perfect as your heavenly Father is perfect." To have God as our model is a dizzying thought! Yet the Church reminds us that, "All the faithful, whatever their condition or state in life, are called by the Lord to that perfect holiness." The Church teaches us that holiness is not the concern of a privileged few, nor does it only pertain to Christians of the past. Holiness is always a call to every Christian of every age, a challenge for anyone who wants to follow in the footsteps of Christ. Pope Benedict XVI says: "Holiness never goes out of fashion; on the contrary, with the passage of time it shines out ever more brightly, expressing man's perennial effort to reach God." Mother Teresa of Calcutta wrote: "Holiness is not something for the extraordinary; it is not a luxury of the few. Holiness is the simple duty for each one of us." The saints are our models and teachers in the ways of holiness. They show us that holiness is possible for us, since they experienced the same difficulties and weaknesses we do, yet persevered in achieving sanctity. The world of saints is a world of wonders, and in this book Pope Benedict XVI helps us to enter into that world. 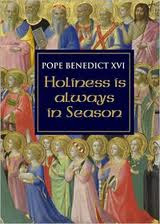 This inspiring volume presents the Pope's numerous reflections on many saints arranged according to the calendar year. He shows how the life of each saint has something unique to teach us about virtue, faith, courage and love of Christ. Dozens of saints are covered in this wonderful spiritual book. The Pope exhorts us through their lives, "Be holy! Be saints!" Book Review: "The Invisible World"
The Gospel for this week (John 11:1-45) shows Martha, a dear friend of Jesus, in great pain. Her brother Lazarus has just died and she holds Jesus accountable. “Lord, if you had been here, my brother would not have died.” Still, she trusts that He can make it right. “But even now I know that whatever you ask of God, God will give you.” Jesus listens to her pain and allows Martha to experience her own suffering. He doesn’t discount or dismiss her feelings. Her faith is rewarded and her brother is brought back to life. Today, I had the privilege of hearing Rev. Mark Stelzer, S.T.D. preach on the topic of pain and the spiritual life. He began his homily by stating that “pain is the touchstone of spiritual growth.” That can be a very hard statement to accept. Fr. Mark acknowledged that we all experience pain of various forms in our lives. The sources of our pain are many: the absence of what we most desire, the end of a friendship or a romantic relationship, the loss of someone we love through death, illness, addiction, or unemployment. Yet, we have been taught from a young age to avoid it as much as possible. Our first inclination is usually to run from pain. If we can’t remove the source of the pain, we seek distractions. We do whatever we can not to think about it. We can also turn to more destructive means of coping such as drugs or alcohol. Fr. Mark asked us to take a different approach with our pain. What if instead of running from our pain, we paid attention to it? What if we listened to our pain “to know what God is saying to us?” What if we acknowledged that our pain, whatever its source, is not the final word? What if we trusted that even in the midst of our pain, God loves us and is working in us? 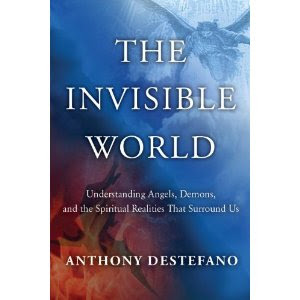 Christian writer Anthony Destefano also emphasizes the important role pain plays in our spiritual life. In “The Invisible World,” Destefano states that “the main reason God permits suffering is because he knows He can change it – somehow, in some way – into a greater good.” In suffering, we have the opportunity to die to ourselves. “The old self has to be willing to give way to the new self.” It is in the moments of the deepest pain that we grow and mature as human beings, but to do that we have to be willing to face the pain and experience it. We can’t run. Destefano continues, “When Christ used suffering to save the world, he transformed it into a weapon to combat evil. It’s because Christ united himself to our suffering that we can now unite our suffering to him and use it to help others.” He encourages us to offer our suffering up in order to help others. No one enjoys pain, but it has an important role to play in our spiritual development. If we ignore or bury the pain, we will never reap the benefit of it. St. Faustina once wrote: “If the angels were capable of envy, they would envy us for two things: one is the receiving of Holy Communion, and the other is suffering.” (Diary, 1804) We need to trust that our pain and suffering has value and serves a higher purpose even when we don’t understand. For those interested in hearing Fr. Mark Stelzer speak, he will be continuing his lenten mission at Holy Name Church at 323 Dickinson Street, Springfield, MA 01108 April 11th and 12th at 5:30 pm. "Study this Catechism with passion and perseverance. Make a sacrifice of your time for it! Study it in the quiet of your room; read it with a friend; form study groups and networks; share with each other on the Internet. By all means continue to talk with each other about your faith." "This book is exciting because it speaks of our own destiny and so deeply engages every one of us." "You need to know what you believe. You need to know your faith with that same precision with which an IT specialist knows the inner workings of a computer. You need to understand it like a good musician knows the piece he is playing. Yes, you need to be more deeply rooted in the faith than the generation of your parents so that you can engage the challenges and temptations of this time with strength and determination." 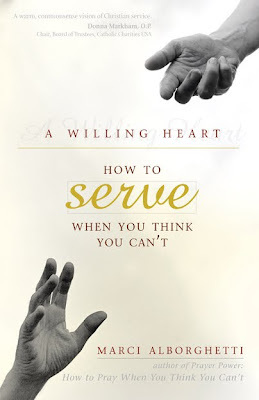 Book Review: "A Willing Heart"
From the desire of being praised......... Deliver me Jesus. In his general audience in St. Peter's Square on April 6th, attended by more than 10,000 people, Benedict XVI dedicated his catechesis to St. Therese of Lisieux, or St. Therese of the Child Jesus and the Holy Face, "who lived in this world for only twenty-four years at the end of the nineteenth century, leading a very simple and hidden life, but who, after her death and the publication of her writings, became one of the best-known and loved saints". "Little Therese", the Pope continued, "never failed to help the most simple souls, the little ones, the poor and the suffering who prayed to her, but also illuminated all the Church with her profound spiritual doctrine, to the point that the Venerable John Paul II, in 1997, granted her the title of Doctor of the Church ... and described her as an 'expert in scientia amoris'. Therese expressed this science, in which all the truth of the faith is revealed in love, in her autobiography 'The Story of a Soul', published a year after her death". Therese was born in 1873 in Alencon, France. She was the youngest of the nine children of Louis and Zelie Martin, and was beatified in 2008. Her mother died when she was four years old, and Therese later suffered from a serious nervous disorder from which she recovered in 1886 thanks to what she later described as "the smile of the Virgin". In 1887 she made a pilgrimage to Rome with her father and sister, where she asked Leo XIII for permission to enter Carmel of Lisieux, at just fifteen years of age. Her wish was granted a year later; however, at the same time her father began to suffer from a serious mental illness, which led Therese to the contemplation of the Holy Face of Christ in his Passion. In 1890 she took her vows. 1896 marked the beginning of a period of great physical and spiritual suffering, which accompanied her until her death. In those moments, "she lived the faith at its most heroic, as the light in the shadows that invade the soul" the Pope said. In this context of suffering, living the greatest love in the littlest things of daily life, the Saint realized her vocation of becoming the love at the heart of the Church". She died in the afternoon of 30 September, 1897, uttering the simple words, "My Lord, I love You!". "These last words are the key to all her doctrine, to her interpretation of the Gospel", the Pope emphasized. "The act of love, expressed in her final breath, was like the continued breathing of the soul ... The words 'Jesus, I love You' are at the centre of all her writings". all, especially for... theologians. With humility and faith, Therese continually entered the heart of the Scriptures which contain the Mystery of Christ. This reading of the Bible, enriched by the science of love, does not oppose academic science. The 'science of the saints', to which she refers on the final page of 'The Story of a Soul', is the highest form of science". "In the Gospel, Therese discovers above all the Mercy of Jesus ... and 'Trust and Love' are therefore the end point of her account of her life, two words that, like beacons, illuminated her saintly path, in order to guide others along the same 'little way of trust and love', of spiritual childhood. Her trust is like that of a child, entrusting herself to the hands of God, and inseparable from her strong, radical commitment to the true love that is the full giving of oneself", the Holy Father concluded. Sophia Institute Press announced today that the Thomas More College of Liberal Arts and Holy Spirit College (Atlanta, GA) have formed a collaborative partnership to preserve and oversee the continuing operations of Sophia Institute Press. While Sophia Institute Press will remain as an independent non-profit organization, it will now be recognized as the publishing division of these two institutions. Gareth Genner, President of Holy Spirit College, will serve as Chairman of the Board, while Thomas More College President William Fahey will oversee the day-to-day operations and serve as its President and Publisher. Sophia’s Board of Directors will be comprised of an equal number of representatives from each college. The concept of collaboration was the brainchild of Gareth Genner, who has served on Sophia’s board for two years. Both presidents indicated their longstanding affection for John Barger and the mission of Sophia Institute Press. Founded in 1983, Sophia Institute Press publishes Catholic classics and new texts by the great and enduring figures of the Catholic intellectual tradition. Over the last 25 years, Sophia has published over 200 titles and disseminated 2.5 million books worldwide to hundreds of thousands of individuals, bookstores, and educational institutions. With the help of Holy Spirit College and the Thomas More College of Liberal Arts, Sophia Institute Press will strengthen its marketing department, and extend its reach into bookstores, institutions, homeschool groups, parishes, and other Catholic markets. Can We Trust God To Give Us What We Desire? Marc Cardaronella has a very interesting post up: Can We Trust God to Give Us What We Desire? As Mark suggests, I do pray every day to do God's will and ask for his help with the desires of my heart. I do try to trust that God knows better than I do what I need, and that in denying or delaying my desires he is teaching me a valuable lesson (even if I don't realize it until many years later. )Sometimes, however, the trusting is very hard. Dear God, please help me to trust in you. "If we are to love those we don't like, we must think of love as an act of will, an action we take and not a feeling that overwhelms us - a verb and not a noun." "Grace is God's way of making to possible to accept this invitation to serve, and grace is what gives us the knowledge that God will protect us and guide us as we serve." "Service starts with prayer, particularly when we are uncertain about how - or whether - to take action. . . Prayer is a contemplative form of service that strengthens and prepares us for active service." "Sometimes in order to not give up on ourselves, or others, or service, we will need to 'act as if.' This is another way to persevere." My original intent when sitting down to write tonight was to reflect on the image of Jesus falling under the weight of the cross in the Stations of the Cross. In the traditional Stations, Jesus falls three times. I think most of us can relate to that image. This Lent, that is the image I can most relate to. My personal cross feels very heavy and I am struggling under the strain, trying to find the resolve to keep going. I take comfort in the idea that Jesus struggled as well. However, as I did some research to further develop this reflection, I came across a fact that I was not aware of – there are actually two approved sets of Stations of the Cross. The traditional Stations of the Cross firmly established since the 1700s have some basis in Scripture, but not all the stations are scripturally based. Pope John Paul II established a Scriptural Way of the Cross on Good Friday 1991 and used them several times during his papacy. In 2007, Pope Benedict XVI approved this set of stations for meditation and public celebration. With the biblical Way of the Cross the intention was not to change the traditional text, which remains fully valid, but quite simply to highlight a few «important stations» which in the textus receptus are either absent or in the background. And indeed this only emphasises the extraordinary richness of the Way of the Cross which no schema can ever fully express. 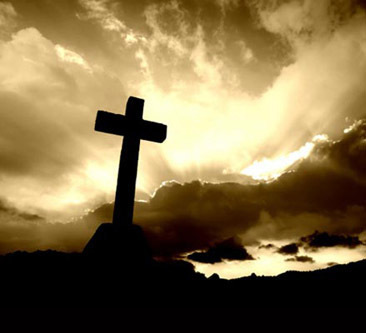 The biblical Way of the Cross sheds light on the tragic role of the various characters involved, and the struggle between light and darkness, between truth and falsehood, which they embody. They all participate in the mystery of the Passion, taking a stance for or against Jesus, the «sign of contradiction» (Lk 2, 34), and thus revealing their hidden thoughts with regard to Christ. Making the Way of the Cross, we, the followers of Jesus, must declare once more our discipleship: weeping like Peter for sins committed; opening our hearts to faith in Jesus the suffering Messiah, like the Good Thief; remaining there at the foot of the Cross of Christ like the Mother and the Disciple, and there with them receiving the Word which redeems, the Blood which purifies, the Spirit which gives life. 14. Jesus is laid in the tomb and covered in incense. The United States Conference of Catholic Bishops offers a set of reflections and prayers to use with these stations at http://www.usccb.org/nab/stations.shtml. This passage from Pausing To Pray Lenten Meditations for Busy People truly resonated with me today. 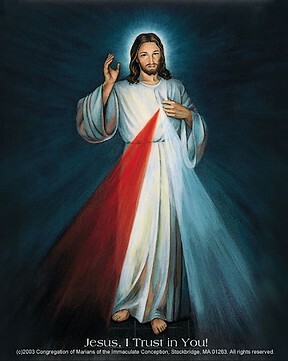 The text in bold is from Diary of Saint Maria Faustina Kowalska: Divine Mercy in My Soul . The reflection is by Fr. Leszek Czelusniak. What do I have to do? What is my mission, my vocation? I have to look for Your will, Jesus. You want to show me that Your plan and your provisions are the best things I could ever have. Your life, dear Jesus, is my best example: You came to do the will of the Father, that was your mission. Such a difficult mission! Yet you prayed for the Father's will, "Thy will be done on earth as it is in heaven." When my crosses seem more than I can bear, let me look to You with trust and echo, "Thy will be done."